Watching movies is an activity that is so normal to us who live in the modern days. With the video technology constantly developing, the movie we watch these days are so much better in every way than the ones we watch ten years ago. Only a few years, the mainstream resolution for videos has evolved from 720P to 1080P, and then to 2K and 4K and even higher. However, when watching a movie or a video, visual resolution is not the only factor that could determine your watching experience and the quality of the video. The sound effect is just as important as visual effects. It does not matter whether you are watching a regular 2D video or a 3D movie or even a VR video, a realistic sound system is a crucial factor of your watching experience. Dolby TrueHD and DTS are two kinds of great sound systems that can boost your watching experience of a movie. Today we are going to talk about the Dolby TrueHD and DTS, and everything you need to know when you want to enjoy a movie with Dolby TrueHD or DTS sound system. Part 1: What is Dolby TrueHD and DTS? Part 2: Can Dolby and DTS apply to Blu-ray Disc? Part 3: How to apply Dolby and DTS on Blu-ray disc? Part 4: How to enable Dolby and DTS on PC? Dolby Laboratories, Inc. (often shortened to Dolby Labs) is an American company founded by American Ray Dolby (1933-2013) in the United Kingdom in 1965, specializing in audio noise reduction and audio encoding/compression. Dolby licenses its technologies to consumer electronics manufacturers. Dolby Atmos started making its way into home theaters a few years ago. Now it’s pretty much standard in receivers with seven or more channels. This “object-based” format assigns audio “objects” to specific locations in your listening area to correspond to where they’d occur naturally in space. This adds a three-dimensional feel to the two-dimensional images on your screen. The overhead or up-firing speakers used in Atmos setups add a third number to the system configuration shorthand. For example, a five-channel Dolby Atmos system with two overhead speakers is a 5.1.2 system. From technical facts listed above, it is difficult to separate the two in the sound experience, because both are committed to being mainstream High-definition applications provide lossless master-band audio effects. But from the usage point of view, both of them are differentiated. Market differentiation will be their future trend. DTS-HD, same as the original DVD era, will be favored by audiophiles; and Dolby TrueHD, with home-based features, is likely to extend its applications, such as high-definition TV signals. Yes. In the Blu-ray Disc specification, Dolby TrueHD is an optional codec. Dolby TrueHD audiotracks may carry up to 8 discrete audio channels (7.1 surround) and 20 objects of 24-bit audio at 96 kHz or up to 6 channels (5.1 surround) at 192 kHz. The maximum encoded bitrate is 18 Mbit/s. Since Dolby TrueHD is an optional codec, a companion Dolby Digital bitstream (2.0 192Kbps or 5.1 448Kbps/640Kbps) must accompany the Dolby TrueHD bitstream on Blu-ray discs. Blu-ray Disc players consider this combination of two audio bitstreams as a single logical audio track, and a Blu-ray Disc player will automatically select the Dolby Digital or Dolby TrueHD bitstream depending on its decoding and/or audio bitstream output capabilities. To apply Dolby or DTS sound effects on a Blu-ray disc, you need a Blu-ray burning program that supports high definition sound input. There are not much Blu-ray burning programs can burn a Blu-ray disc and keep the Dolby or DTS sound effects absolutely intact in the Blu-ray. However, there is a good Blu-ray burning program that I would like to recommend you if you want to retain the Dolby or DTS sound effects in your burned Blu-ray. The program that I want to recommend is Leawo Blu-ray Creator. 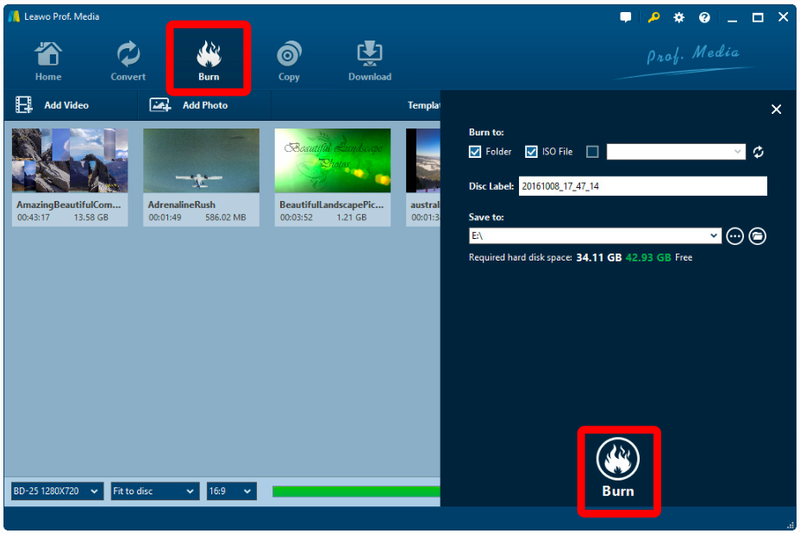 Leawo Blu-ray Creator is a professional Blu-ray or DVD burning program. The software can burn all kinds of videos to a Blu-ray or DVD disc or an ISO image or a folder and keep the original visual and sound effects in the same time. If you burn your video with Leawo Blu-ray Creator, you will be able to keep the Dolby or DTS sound effect absolutely intact in your video and you can have a great result after the burning. 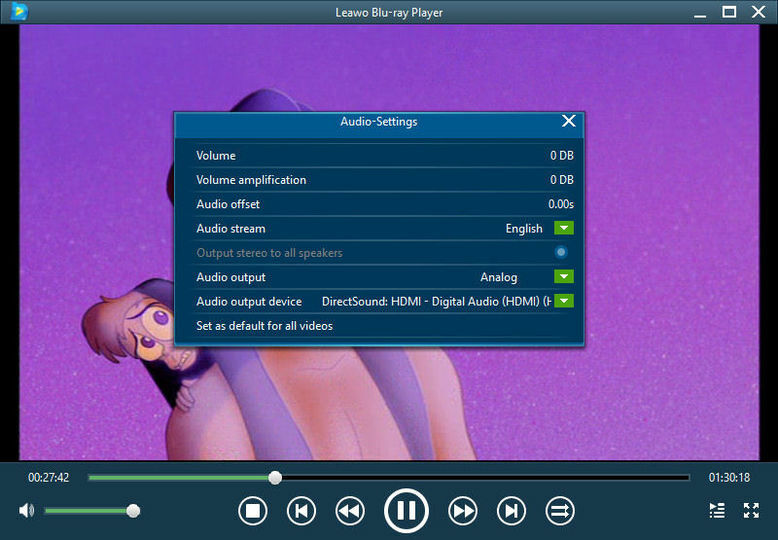 It is very easy to burn a video with Dolby or DTS sound effect to a Blu-ray or DVD with Leawo Blu-ray Creator. Now I’ll show you the detailed steps in case you want to know more about this professional Blu-ray burning program. Step 1. Add videos to the program. You can import your WMV videos in 2 ways: a. Click the “Add Video” button to load videos and images. b. Directly drag and drop files to the program. After loading source video files, you could select subtitles and audio tracks from source videos, play back videos, etc. Set the output DVD disc type, quality and aspect ratio (16:9 or 4:3) at the bottom. Step 2. Design disc menu (optional) If you want to add disc menu to output DVD movie, you could choose from the right sidebar. Leawo DVD Creator offers you multiple preset disc menu templates in different themes like Standard, Business, Education, Childhood, Holiday, etc. Also, it allows you to DIY disc menu with your own images and audios. You could get instant preview of the menu you’ve selected. If you want no menu, just select “No Menu” option on the right sidebar after you load source videos. Step 3. DVD burning settings. After setting disc menu, click the big green “Burn” button to call out the burning settings panel, on which you need to figure out Burn to, Disc Label, and Save to options. Step 4: Burn the video. After the burning settings, click the “Burn” button on the popup burning settings panel to start burning videos to DVD. This DVD Creator would immediately start its work and finish it in a few minutes. Burning your video with Dolby or DTS sound effects to a Blu-ray or DVD disc is a good way to enjoy your movies. But there is another way for you to enjoy the amazing sound effect easier. With a media player that is powerful enough to support Dolby and DTS sound effect, you can enjoy the video with Dolby or DTS sound effects on your Windows or Mac PC instantly. And the program that I am going to recommend for Dolby or DTS video playback, is a professional video player called Leawo Blu-ray Player. Leawo Blu-ray Player is a professional video player as well as DVD and Blu-ray disc player. As a 100% free and 6-in-1 media player software, Leawo Blu-ray Player contains all media playback solutions you need for your leisure entertainment, including DVD, Blu-ray, CD, HD (4K), ISO file with AVI, MPEG, ASF, FLV, MKV/MKA, or audio format MP3, WMV, AAC, AC3 and other popular formats supported. With advanced image and audio processing technology, Leawo Free Blu-ray Player software could provide you quality-lossless image for even 4K video, stereo audio enjoyment, all regions free DVD decryption and user-oriented playback control. With the advanced audio playback solution, you can enjoy the Dolby or DTS sound effects as the original. Also, you can have various audio settings to boost the sound effects of the movie that is being played.